Another potential criticism of the location of Hudson Terminal is that it would lengthen commuter trips for those traveling by NJ Transit or Amtrak into Manhattan. At first glance, it may seem that a station placed farther away from the center of midtown would result in longer commuting times. However, there are two important considerations that prove this premise false. 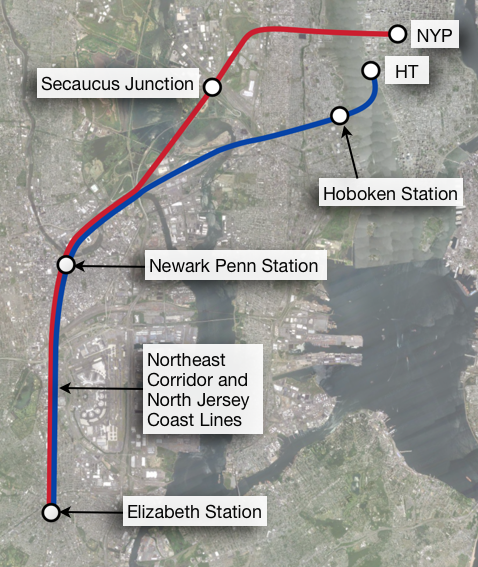 First, trains traveling along NJ Transit and Amtrak lines into Hudson Terminal would benefit from shorter trip times into Manhattan due to either the availability of a one-seat ride from points north or the ability to bypass the two-mile Secaucus Junction detour from points south and west. Second, once in Manhattan, Hudson Terminal will offer a more diverse selection of mass transit options for commuters since both the 7-Line and L-Line are crosstown routes. Where both LIRR and Metro North riders will one day have the option of terminating in either Grand Central Terminal or Penn Station, NJ Transit and Amtrak riders are currently stuck with just Penn Station. Hudson Terminal will provide riders alternative travel options in order to greatly increase efficiency along regional transit routes. The Northeast Corridor and North Jersey Coast Lines provide direct service to New York Penn Station with intermediate service to Newark Penn Station and Secaucus Junction. These lines also provide periodic service to Hoboken by way of the single-track Waterfront Connection. Trains traveling from Newark Penn Station to New York Penn Station take an average of 21 minutes to travel 10.1 miles. Trains traveling from Newark Penn Station to Hoboken take an average of 22 minutes to travel 7.4 miles. This apparent discrepancy in speed, however, can be attributed to the fact that the only trains traveling to Hoboken along these lines are non-electric, diesel locomotives originating at stations south of Long Branch. Electric locomotives make up the majority of commuter rail locomotives and are ideal for commuter rail service with frequent stops. Compared with diesel locomotives, electric locomotives generally have a higher power output and can produce even higher short-term surge power for fast acceleration. This means that diesel locomotives, while not limited by maximum speed, nevertheless take longer amounts of time to accelerate and decelerate quickly, resulting in a longer travel time for short distances. Assuming, however, that the Northeast Corridor and North Jersey Coast Lines brought either electric or dual-powered locomotives to Hudson Terminal, the 7.4 mile trip from Newark Penn Station would take an average of 15 minutes. 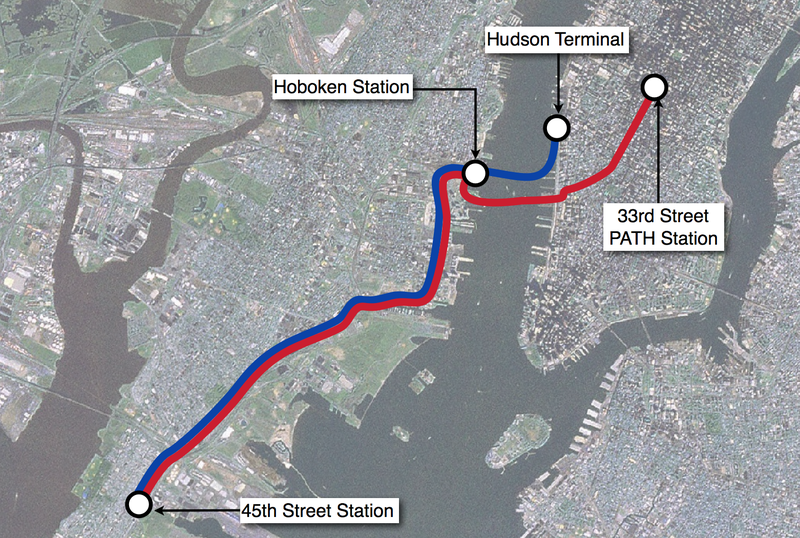 Adding the connection from Hoboken to Hudson Terminal, the total travel time from Newark Penn Station to Hudson Terminal would be approximately 18 minutes. Suppose a passenger wanted to travel from Elizabeth, NJ to Manhattan at 7:15 AM on a weekday. According to NJ Transit train schedules, the total trip time to Penn Station would be 34 minutes, including 13 minutes from Elizabeth, NJ to Newark Penn Station, and 21 minutes from Newark Penn Station to New York Penn Station. In contrast, the total trip time from Elizabeth, NJ to Hudson Terminal would be 31 minutes (a difference of 3 minutes), including 13 minutes from Elizabeth, NJ to Newark Penn Station, and 18 minutes from Newark Penn Station to Hudson Terminal. Up until early 2014, the Raritan Valley Line was unable to provide direct service to New York Penn Station for two primary reasons. The first reason was that New York Penn Station did not have the current cross-Hudson or Manhattan train capacity to support additional peak-hour, NJ Transit service from the Raritan Valley Line. Secondly, the Raritan Valley Line is not electrified and must utilize diesel locomotives, which are banned in the North River Tunnels and Penn Station. As part of the cancelled ARC project, NJ Transit purchased 35 dual-mode locomotives from 2008 to 2010, which are capable of operating on both electrified and non-electrified track. Today, five Raritan Valley Line trains travel into and out of New York Penn Station. However, because of ongoing capacity constraints, these trains can only operate during off-peak hours. 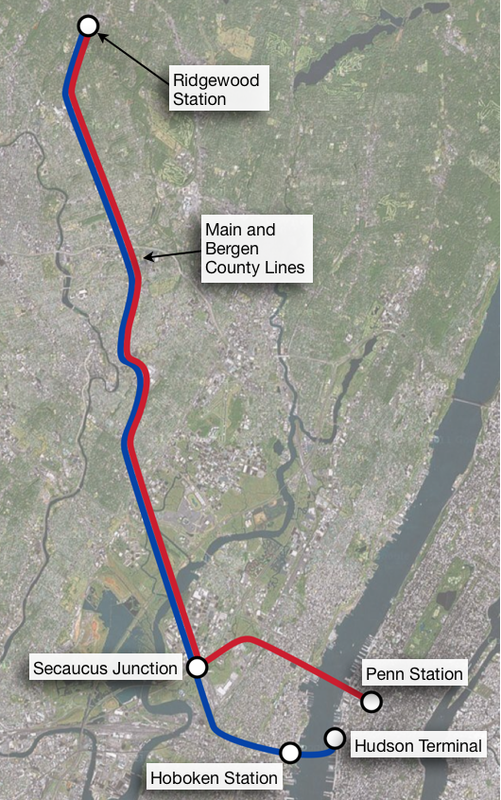 Nevertheless, Raritan Valley Line service into Hudson Terminal would be feasible given the terminal’s abundance of Manhattan trackage. Suppose a passenger wanted to travel from Plainfield, NJ to Manhattan at 8:00 AM on a weekday. According to NJ Transit train schedules, the total trip time to Penn Station would be 65 minutes, including 37 minutes from Plainfield, NJ to Newark Penn Station, a 7 minute transfer time, and 21 minutes from Newark Penn Station to New York Penn Station. In contrast, the total trip time from Plainfield, NJ to Hudson Terminal would be 55 minutes (a difference of 10 minutes), including 37 minutes from Plainfield, NJ to Newark Penn Station, and 18 minutes from Newark Penn Station to Hudson Terminal. Since both the Main and Bergen County Lines do not include direct service to Penn Station, passengers wishing to terminate in Manhattan must transfer at Secaucus Junction. During peak morning service, it takes an average of 21 minutes for passengers arriving at Secaucus Junction to travel to transfer trains and continue to Penn Station. If passengers stayed on the train instead of transferring, it would take an average of 12 minutes to travel from Secaucus Junction to Hoboken. Adding in the 3 minute trip time from Hoboken to Hudson Terminal, the average time saved for passengers traveling on the Main and Bergen County Lines to Hudson Terminal instead of Penn Station would be 6 minutes. In addition, like the Raritan Valley Line, the Main and Bergen Lines are not electrified, and would have to incorporate dual-mode locomotives to travel to Hudson Terminal. Suppose a passenger wanted to travel from Ridgewood, NJ to Manhattan at 6:30 AM on a weekday. According to NJ Transit train schedules, the total trip time to Penn Station would be 58 minutes, including 37 minutes to Secaucus Junction, a 6 minute layover, and 15 minutes from Secaucus Junction to Penn Station. In contrast, the total trip time from Ridgewood, NJ to Hudson Terminal would be 52 minutes (a difference of 6 minutes), including 49 minutes from Ridgewood, NJ to Hoboken Station, and 3 minutes from Hoboken Station to Hudson Terminal.